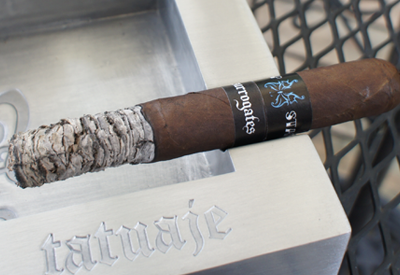 Just like a few days ago, today's review is for a brand new stick coming from L'Atelier Surrogates. The Tramp Stamp (referring to the pop culture name for a tattoo on ones' lower back) is an obvious play on words with Tatuaje (Spanish for tattoo.) 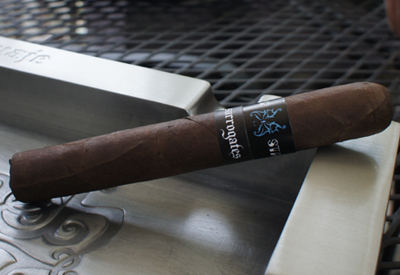 Tramp Stamp will be the fourth release in the Surrogates line and the second to be sold through the new L'Atelier Imports company. 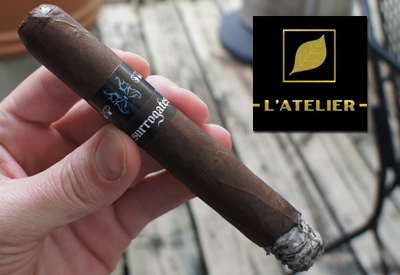 (Check my last review for info on the origin of Surrogates and L'Atelier.) Pete Johnson (the owner of Tatuaje) has been quoted as saying that it is a blend based off of his personal "Black Label" blend that, up until a few years ago, was only available at Tatuaje events Pete attended. I'm a big fan of most of the Black Label releases, so I was very interested to see what this take on the blend would be like. The image on the Tramp Stamp band is perfect for the name --a classic, almost cliche "tramp stamp" tattoo-looking butterfly. Props for the creativity. It's not the classiest band, but hey. It's called Tramp Stamp. What did you expect? The wrapper was a very lush, dark brown with a lot of visible oils. There were just a few big veins, but all-in-all, it wasn't too ugly a wrapper. The aroma was faint, but I picked up cedar and hay, especially near the foot which was closed off with extra wrapper. The cold draw was tight (closed foot) but had a strong, distinct fresh almond flavor. 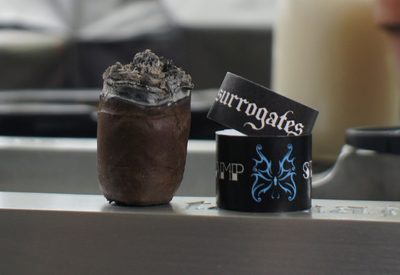 Something also to note: this is is the first cigar in the Surrogates line with a smaller ring gauge. I'm sure that will make at least a few cigar enthusiasts happy, since the current model for new cigars seems to be the bigger the better. Lighting the closed foot of my Tramp Stamp was no issue and produced a nice, even burn straight away. The immediate Pepin black pepper was on full on the front with a spicy clove element that really had my palate roaring. The finish was just as strong in flavor with a herbal taste that gave way to some oak and leather. 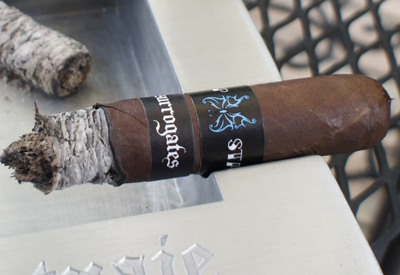 I burned about an inch into the stick and the flavors only got stronger, but they also seemed to get smoother and blended a bit more between the spicy front end and complex finish. To say I was happy with this kind of start is an understatement. The construction was excellent; even with the wind we were having, the ash held strong. I'd put the nicotine strength in the medium range. The second third of my Tramp Stamp had many similar characteristics as the first (a good thing), but also a a few changes. The signature black pepper flavor on the front fell off a bit, but that's not to say the spiciness had. What the pepper gave away to was a stronger version of the sweet/spicy clove that had been present in the first third, but at this point, had become a real focal point. I love everything about clove - always have, so I was really enjoying myself. The finish lost the oak notes from the first third, but picked up some hints of espresso in addition to the leather. Espresso and leather sounds like an odd combo, but I have a tendency to pick it up in many of the cigars I smoke. The construction and nicotine strength were consistent with the first third - perfect and medium, respectively. The front of the flavor profile in the final third was a clone of the second, but the finish took an interesting twist. The finish (especially down at the nub) took on a very clean and obvious mocha flavor. I was not expecting this, as there were no hints in the first two parts of this cigar. The mocha created a new balance with the spicy clove (and slight pepper) that was still going strong on the front. Truly, this addition was icing on the cake for me. Unlike a lot of cigars I've smoked recently, the nicotine strength didn't ramp up at the end but instead stayed a consistent medium the whole way through - a great smoke for anytime of the day. Final thoughts on the L'Atelier Surrogates Tramp Stamp (pre-release)? 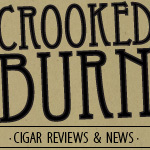 If you read the review above, you'll notice that I pretty much gushed about how much I enjoyed this cigar. It is something I could easily smoke back to back. (I wish I had more!) People are going to ask how it compares to the Tatauje Black label and, in my opinion, it has a lot of the same characteristics but takes them to the next level. A new contender for Cigar of the Year has arrived for me. Would I buy a box? Multiple.